The London Underground system, known as ‘the Tube’ is often held up as the quintessential underground network map as it navigates the city dwellers to and from their starting point and destination with ease, in contrast to the complex and non-grid-lined road layout of the above ground roads (Vertesi, 2008). For Londoners, it is the main mode of transport through the city, carrying up to 3.4 million people on a normal weekday (TFL, 2007). Despite the Tube’s usage (and its regular notorieties), it remains largely absent from the literature as a means of location rationale for business. Often when people buy houses they take into account the transport connections and proximity to the tube network and the prices can be upwardly mobile because of it, but can this be true of businesses? Does this vary from sector to sector, from industry to industry? This brief study correlated the location of the top 100 music companies in London (ranked by turnover) with the location of the London Underground stations to provide the map shown in Map 1. The layout of the ‘view’ on the map has been altered to a bird’s eye view, as it best reflected the phenomenon visually. Names have been removed for clarity, but those familiar with the London Underground map will be able to pinpoint the lines and stations. The music companies in the CIO database consist of record labels and major music producers (including studios), agencies and the musicians themselves. The top companies tend to part of international media conglomerates (EMI, Warner Music etc), and therefore have strong connections with other cities and countries around the globe (i.e. global pipelines (Bathelt et al., 2004)). As we have seen from the discussion in the previous section, these global connections are complemented by local ‘buzz’ and therefore, connecting to the ‘smaller’ more locally-orientated companies is an important part of continuing their knowledge-base through informal social networks and tacit knowledge interchange. What this information shows is how many of the top 100 music companies are located on the main tube links within London. The area of the West End, where the majority of these music companies cluster is a hotspot for many creative industry companies, not just music, and so the larger firms will prefer to locate here in order to take account of the local ‘buzz’ and agglomeration success factors (Scott, 1997). However, those companies that are not located in the central parts of the city tend to find alternative residents in areas that are easily accessible by the London Underground network. Note (in Map 1) how the west of the city is where the majority of the music companies reside, and is also better served by the London Underground network. In particular, the Hammersmith and City Line (pink line on Map 1) and the District Line (dark green line) are heavily populated with music companies, notably in the area between the stations of Hammersmith and Shepard’s Bush, and around Putney Bridge of the southern branch. The Victoria Line is also an important line with 3 of the top 100 music companies in London directly in the vicinity of Brixton (to the south), Seven Sisters and Blackhorse Road stations (to the north). In this map, the music companies within the top 1000 (within the CIO database – note Map 1 only shows top 100) in the Camden Town area are shown. The red circles represent each postcode, with their corresponding number of companies. Further research found that the companies that shared the postcodes also shared the same address, thereby occupying the same building. For example, the postcode NW1 0AD was shared by no less than 20 companies – with further research suggesting they occupy the same building, that being 1 Regent House, Pratt Mews. Upon investigation these companies are small, micro-businesses, in some cases, freelancers, suggesting that this building is a form of rented accommodation for micro music businesses. Camden Town has a certain affinity as the major location of London’s music scene (Watson, 2008), housing many ‘alternative’ venues (such as the Roundhouse, Koko and WKD); and so for the purposes of social networking and ‘serendipitous encounters’ (Leamer and Storper, 2001) companies will want to locate here in order to take advantage of the local ‘buzz’. However, it has also been suggested that while being in the right place helps in maintaining social networks and therefore blur the business-social divide and transgresses the boundaries of the firm (Porter, 1998), competition between people/companies in the same genre and in the same line of business (artist management, distribution, ticket sales etc.) can face increased competition though proximity (Watson, 2008). The fluidity and tacit nature of knowledge means that these enclaves of music companies may reduce their competitive edge, while increasing that of your competitor. However, the proximity to the two London Underground stations of Camden Town to the north and Mornington Cresent to the south would imply that these companies therefore see the advantages of the social milieu of Camden Town more of a benefit that the potential loss of competitive knowledge is a disadvantage. The commute to their offices by the employees of these companies may very well be shorter if they chose not to locate in Camden, indeed if these companies are freelancers (the early research indicates that at least 15 of the 20 companies in 1 Regent House are one-man-bands) then they could potentially work from home. 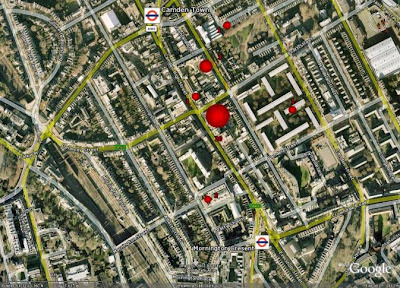 The presence of these clusters near the Tube stations (and therefore in the Camden cluster) hence offers an interesting starting point of enquiry into the nuances of these clusters and their location near high mobility networks such as ‘the Tube’. Further exploration is needed therefore to unearth the causal factors behind the location of these companies to see exactly how relevant the transport links are, and if this phenomenon varies through time, across different locations, or according to industry, be it creative or not. If you would like the kmz files to have a play around with yourself, email me. Bathelt H, Malmberg A and Maskell P. (2004) ‘Clusters and knowledge: local buzz, global pipelines and the process of knowledge creation’. Progress in Human Geography. 28(1): 31-56. Leamer E & Storper M. (2001) ‘The economic geography of the internet age’. Journal of International Business Studies 3 (4):641-655. Porter M. (1998) ‘Clusters and the New Economics of Competition’. Harvard Business Review. 11(77-90). Transport for London (2007). ‘Tube carries one billion passengers for first time’. Press release. Retrieved on 2007-04-02. Vertesi, J. (forthcoming, 2008) “Mind the Gap: The London Underground Map and Users’ Representations of Urban Space”, Social Studies of Science 38(1). To be reprinted in Visual Communication and Culture: A Reader (2008) ed. Finn F. Oxford University Press, Oxford. Watson, A. (2008) ‘Global music city: knowledge and geographical proximity in London’s recorded music industry’, Area, 40, 12-23. Categories: Creative Industries, London Underground, Music Industry | Permalink.